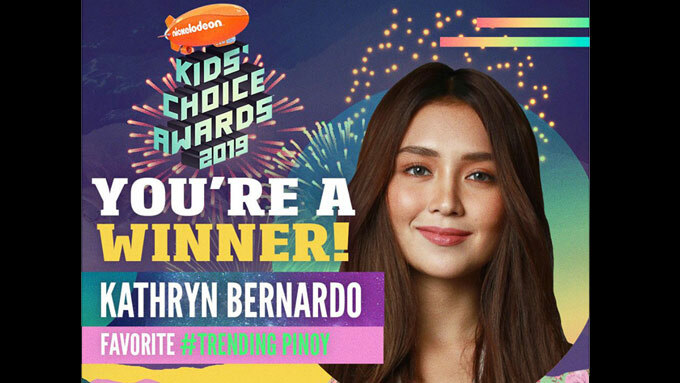 Kathryn Bernardo emerged as the Favorite Trending Pinoy artist at this year’s Nickelodeon’s Kids’ Choice Awards. "Hey Nicksters! Thank you so much for voting for me for the 2109 Nickelodeon’s Kids’ Choice Awards. Keep supporting Nickelodeon and your favorite Filipino artists," said Kathryn in a short video uploaded in the Facebook page of Nickelodeon. Kathryn is slated to do a still-untitled Star Cinema movie with Alden Richards. Meanwhile, Filipino siblings who became viral sensations emerged as the 2019 Favorite Pinoy Internet Star. Ranz Kyle and Niana won in this category of Nickelodeon’s Kids’ Choice Awards. The brother-and-sister tandem was able to beat fellow nominees Ella Cruz, Hannah Pangilinan, and Kristel Fulgar.